If you were reading the papers over the last few days you will have probably seen the house price data from the Nationwide reported on. This will have been taken straight from their press release and I’m sure monthly changes of -0.9% will have been mentioned. I however prefer to analyse the raw data as the figures presented to the press are seasonally adjusted. The actual figures are worse than that reported. In July 2010 prices were £169,347 and in August they are now £166,507. That is a fall of 1.7% in a single month with the annual change now at +3.9%. This is now 2 months in a row that we have seen price falls. This is all shown in my 1st chart today. 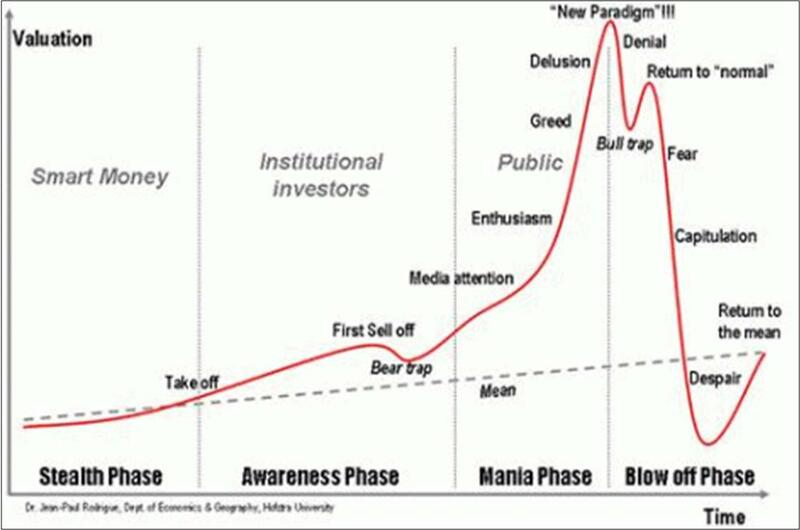 I’m starting to wonder if we have reached the ‘Return to “normal”’ phase which will “soon” turn to ‘Fear’ as shown in my 4th chart. I’m making no predictions as this is not a free market and is badly distorted by government intervention to name but one. Anything could be proposed to try and prop the market up as we have seen time and time again over the past few years. All I’ll say is it’s starting to get interesting and the 1st chart and the 4th chart are starting to look similar. I will however make a prediction that “eventually” we will see significant falls because House Prices are simply unsustainably high. Nothing more and nothing less. The only question is how long I will have to wait. As always let us now look at the data inflation adjusted. 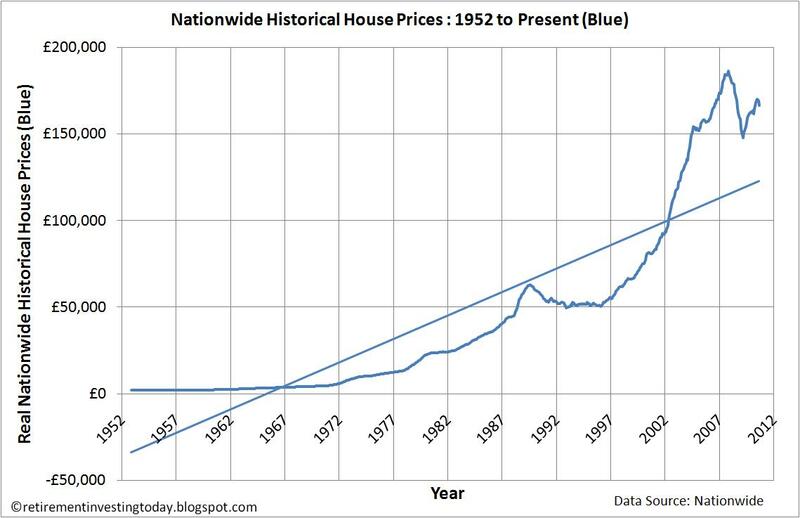 My 2nd chart today shows the Real (inflation adjusted) Nationwide Historical House Prices. Month on month real prices have gone from £168,963 to £166,507 which is a fall of £2,456 or 1.5%. Year on year Real prices have now turned negative at -0.1%. 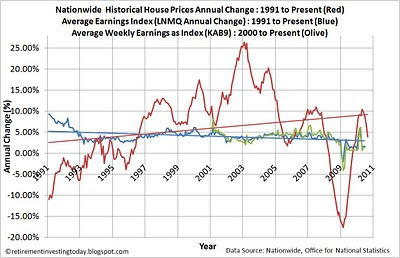 This chart also shows the current affordability of housing by comparing prices with average earnings. For this comparison we have to go back to June 2010 as that is the last publication data for Average Weekly Earnings, KAB9, which I convert into an Index for the chart. This shows as of June affordability continuing to decline. 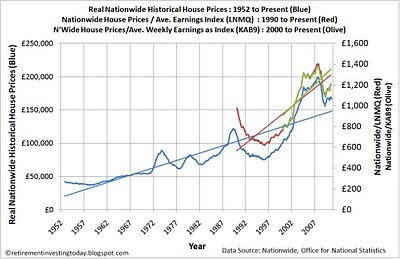 If Weekly Earnings can continue to increase slightly we might just see this reverse next month if House Prices continue in the same way that we have seen for the last 2 months. I must say a readjustment in affordability is badly needed for those who ever want to own an affordable house where you are not saddled with debt for the rest of your life. For June 2010 the KAB9 Average Weekly Earnings was £455 which is £23,660 per annum. 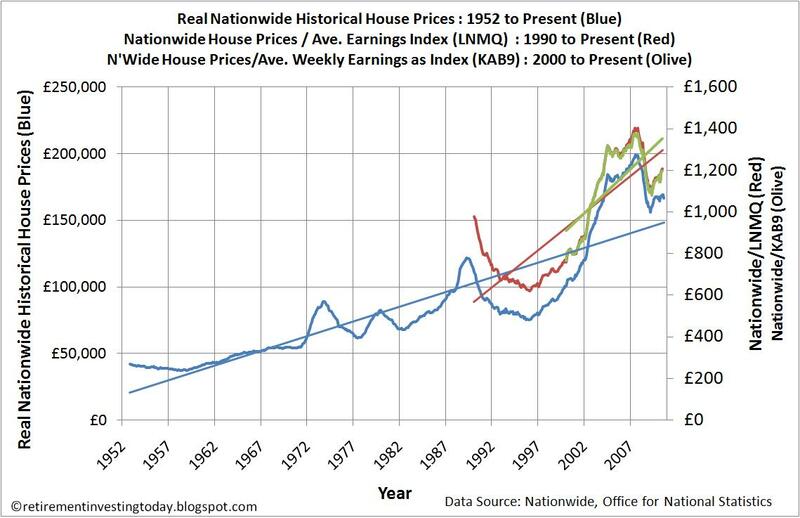 That means by this measure the Average House Price is today 7 times that of the Average Earnings. In comparison back in January 2000 which is when my Average Weekly Earnings dataset begins the ratio was 4.6. 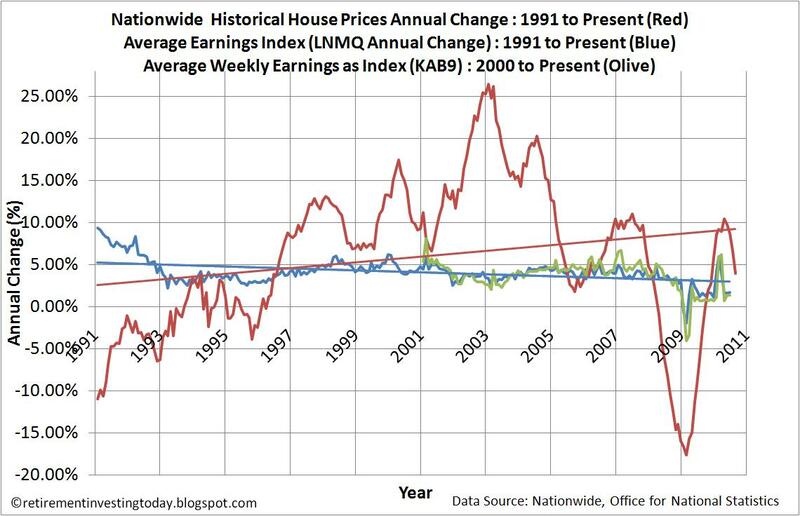 My 3rd chart shows how House Prices and Earnings are changing year on year. In June 2010 House Prices were still increasing at 8.7% year on year but as I mentioned above this is now down to 3.9%. Unfortunately in comparison for June 2010 Average Weekly Earnings are only increasing at 1.3% year on year, which is significantly less than inflation, meaning that as of June houses were still rising in price faster than earnings. I personally continue to sit on the sidelines and watch. Who knows one day I might be able to buy a house for my family. - Nationwide data is to August 2010. - All earnings data (LNMQ, KAB9) is to June 2010. - RPI data is extrapolated for August 2010. I'm not sure that house prices will conform that closely to Rodrigue's graph, but frankly any excuse to show it is always welcome! 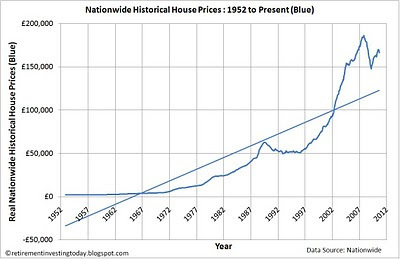 I do agree, however, that house prices must fall, but I suspect it will be a ragged, drawn out affair. Over the past year, low interest rates and public sector employment have prevented a flood of repossessions, but this will surely change in 2011/12. 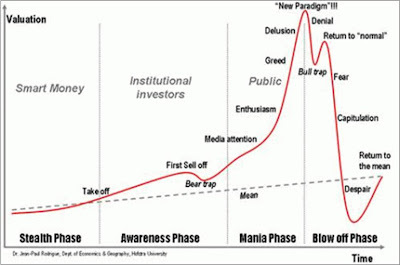 I would not like to predict when the bottom will occur nor how deep it will be -- not as deep as in the USA, I suspect. I also agree that it probably won't conform as in addition to your good points the market is so distorted. The policy makers also have probably not finished dabling in the market yet. Once prices do start to fall (or IMO simply readjust to fair value) they will I'm sure panic yet again. I'm not so sure about the trend always being upwards however. In nominal terms yes I do agree as that is influenced by the devaluation of money through inflation. In real terms we could see falls for a long time as this was such a big boom. You might be right on the >10 years though. We could be back to break even or so by then but that is a lot of opportunity cost lost over that period. If you're looking for something to bring the housing market to its senses, you could do worse than note the end of the BOE special liquidity scheme in January 2011. The CML has said that there is a £300bn mortgage funding gap that only the liquidity scheme is holding at bay. When that goes mortgage lending may shrink further (collapse?) and get more expensive at the same time. Thanks for highlighting the SLS. I've been watching that also. I'm wondering though if the government are just talking big at the moment but once they see they lending shrink (which I'm sure the banks will also make sure happens while leaking plenty of details to the press about how the government is damaging the mortgage market) then they will panic and will create a new SLS. As the markets get back to the level I consider fair-ish value for the outlook (maybe 10%-20% more to go, absent big earnings revisions upwards) I've been idly looking about the property market in the past few months and wondering if I should finally by somewhere. Anyway, these graphs confirm what I'm seeing here in London. Everything is still bonkers expensive on an earnings basis, and versus other stuff you can buy for the money, and almost as bad versus rent. Only on affordability is any sense of reality restored (though property is still hardly cheap, then). But how long will sub-5% mortgage rates prevail for? Like you I have also been renting for a long time. 10 years in my case. This has not always been because of affordability. Originally it was because I wanted the freedome of movement. Only in the past few years have I actually wanted to buy but graphs like those that I displayed above keep me out of the market for now.